The Conference Board’s Consumer Confidence Index (CCI) and the University of Michigan Consumer Sentiment Survey showed an improvement in consumer confidence during February 2012. 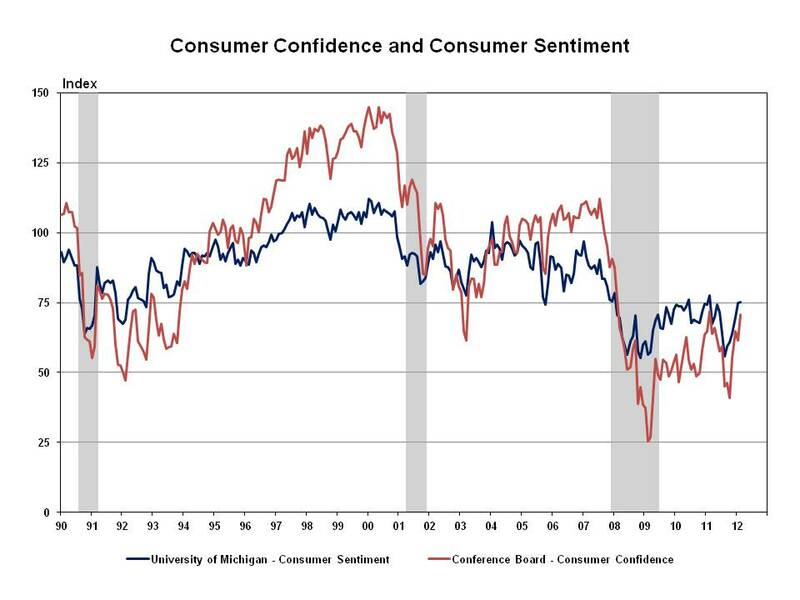 Although certain components within each survey showed some conflicting results, specifically a slight decline in the U of Michigan’s current conditions index, both sources reveal overall consumer confidence has trended appreciably higher since the third quarter of 2011. While higher prices at the gas pump could be weighing on consumers’ perceptions of current economic conditions, improving payroll and housing market data might be fostering some optimism that the economic recovery will not falter. For example, payroll employment registered a net gain of 243,000 during January and over the past three months has increased at a rate of 201,000—the fastest rate since last spring—and the unemployment rate fell to 8.3, its lowest reading in nearly 3 years. Results from the Conference Board’s CCI possibly confirm an improving perception of the labor market. Although a majority of respondents to the CCI report that jobs were “not so plentiful” during February, the share of consumers indicating that jobs were “hard to get” dropped to its lowest reading (38.7%) since November 2008. Moreover, expectations for job growth 6 months hence reveal a higher share of participants expecting more jobs to be available (18.7%) compared to those anticipating fewer jobs (16.9%). February 2010 was the last time a higher share has expected more jobs to be available over the next 6 months. Must be all the Love in the air!